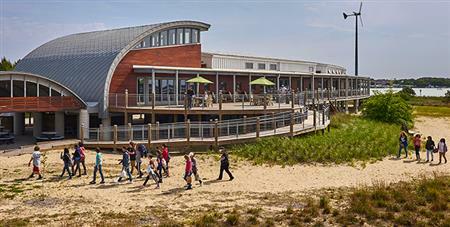 Join fellow Rotarians for a return visit to the amazing Brock Environmental Center! Space is limited, so registration is open only to Rotarians and their guests. We will meet our tour guide upon check-in at the information desk. Please be on time! The Chesapeake Bay Foundation built the Brock Environmental Center to engage, inform, and inspire generations about the environment and how we can all help Save the Bay. Raising the bar for environmentally intelligent building and living, the Brock Environmental Center is a national and international model for green building techniques, materials, energy efficiency, water use, and landscaping as well as efficiency, beauty, and inspiration. With its energy-generating solar panels and wind turbines, geothermal wells, rain cisterns, composting toilets, rain guards, and elevation 13 feet above sea level, the Center is among the most environmentally smart, energy-efficient buildings in the world. The Center also serves as local headquarters for the Chesapeake Bay Foundation, which is among the recipients of this year's Norfolk Rotary Grants program. DIRECTIONS & PARKING INFORMATION: Traveling from Northampton Blvd (US-13), exit onto US-60E/Shore Drive (the exit just south of Chesapeake Bay Bridge Tunnel). Continue 1.1 miles on Shore Drive and turn right onto Marlin Bay Drive. Follow Marlin Bay Drive down past the natural areas on the right and houses on the left. You may parallel-park along either side of the road. Walk the foot path at the end of Marlin Bay Drive through the woods along the white light poles (about a 5-minute walk) to the Brock Center. ADA Parking: There are three handicapped parking spaces by the main entrance and one in the paver parking lot. From Marlin Bay Drive, turn left to round the sharp curve. Take an immediate right onto Chesterfield until you see the brick paver lot on your right. Drive up the paver parking area; the ADA spaces are adjacent to the entrance of the building.